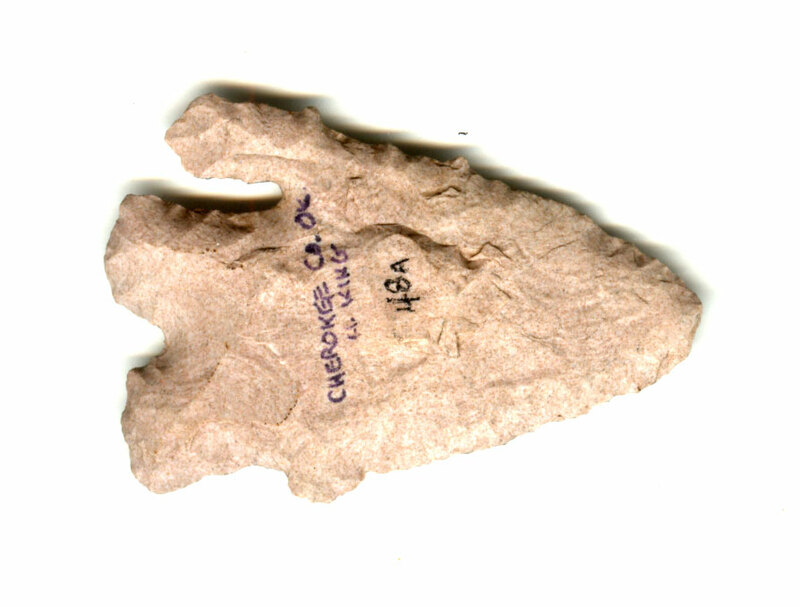 A Medium Size, Colorful, Visibly Aged And Heavily Anciently Used, Nicely Made Calf Creek Point that Exhibits Surface Aging Oxidation And Stone Coloration Patination, Aging In The Basal Notch, Correct Blade Sharpening Use Reduction, Aged Surface Deposits, Correct Type Blade Flaking, Correct Basal Style And Overall Form, Correct Material And Manufacture For The Area Found. Found By Harvey King. Ancient Blade Use Sharpening Has Eliminated One Tang. Ex-Harvey King And Roy Hathcock Collections. This Is An Early Example, Related To The Cossatot River Point Types, Having A Notched Base! Sold At The Roy Hathcock Artifact Auction 11/7/15. Includes A Ken Partain Certificate Of Authenticity!